Some of our beloved furry friends have skin allergies and sensitivities that can make it difficult to get clean and remain simultaneously happy. (Puppies & kittens often fall into this category). 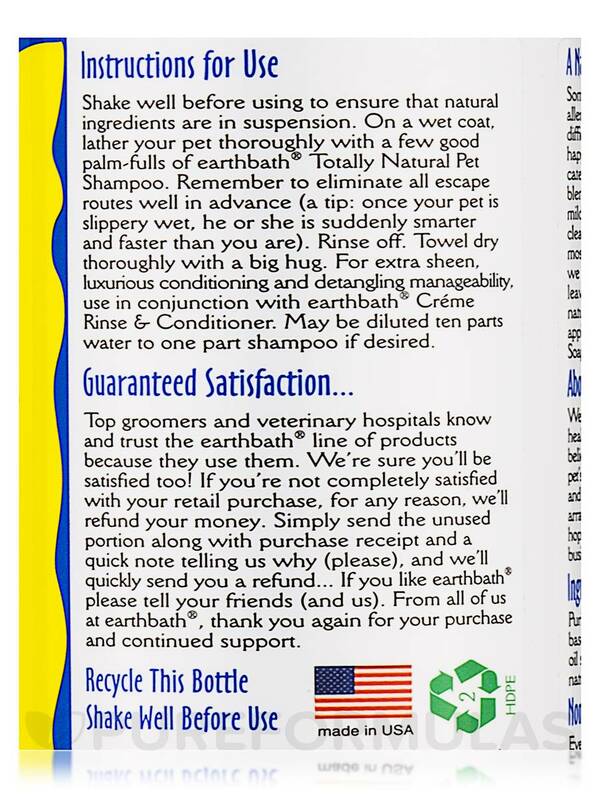 Earthbath solved this dilemma by blending the finest natural ingredients into this mild‚ hypoallergenic‚ tearless shampoo. It cleanses thoroughly and safely‚ and even the most sensitive skin will not be affected because we used only mild‚ safe‚ non-irritants. It will leave your pet's coat soft‚ plush‚ and smelling naturally fresh. Will not wash off topical flea applications. Safe for all animals over 6 weeks. Soap free. Purified Water‚ Extra-Mild Renewable Coconut- Based Cleansers‚ Aloe Vera‚ Xanthan Gum‚ Olive Oil Squalene (natural preservative). All ingredients are Natural‚ 100% Biodegradable‚ and Gentle. 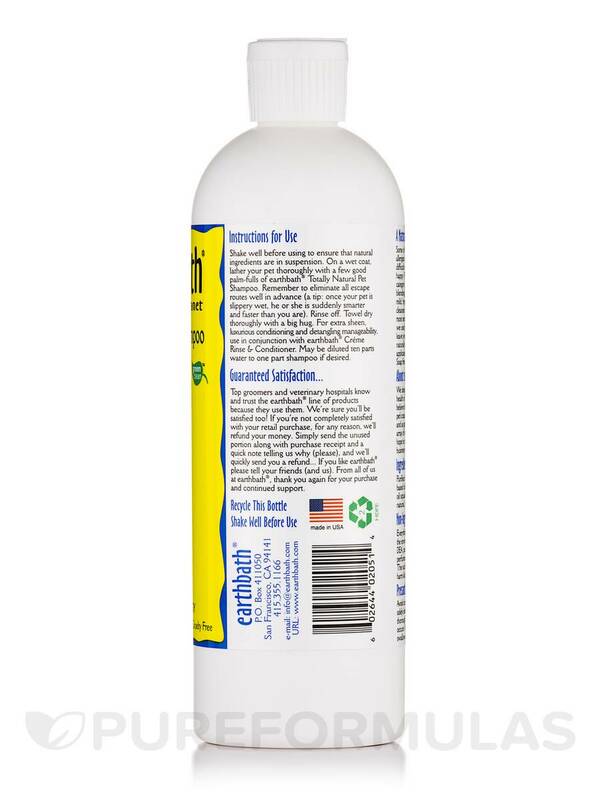 This product contains no: Parabens‚ Phosphates‚ Phthalates‚ DEA‚ Synthetic Dyes or Perfumes. The sudsy runoff is completely safe and will not harm kids‚ lawns or other living things. Shake well before using to ensure that natural ingredients are in suspension. 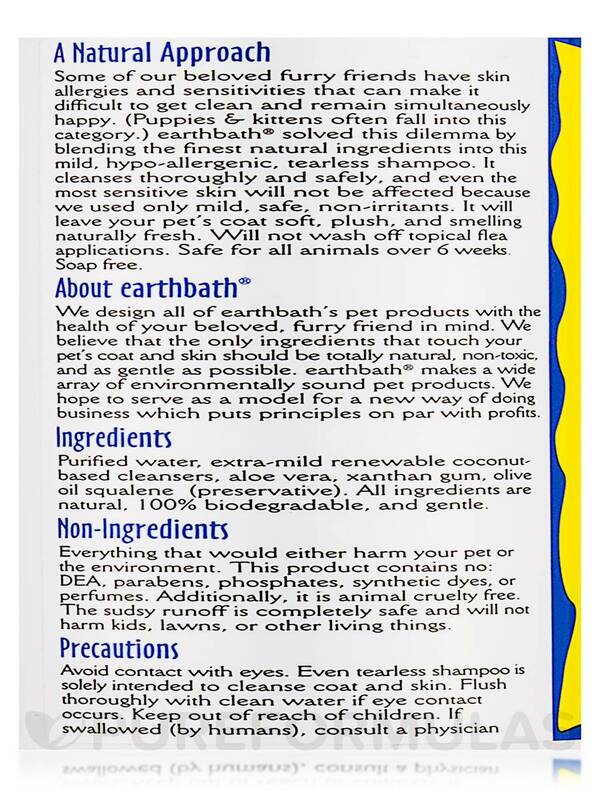 On a wet coat‚ lather your pet thoroughly with a few good palm-fulls of Earthbath Totally Natural Pet Shampoo. Remember to eliminate all escape routes well in advance (a tip: once your pet is slippery wet‚ he or she is suddenly smarter and faster than you are). Rinse off. Towel dry thoroughly with a big hug. For extra sheen‚ luxurious conditioning and detangling manageability‚ use in conjunction with Earthbath Crème Rinse and Conditioner. May be diluted 25 parts water to 1 part shampoo if desired. 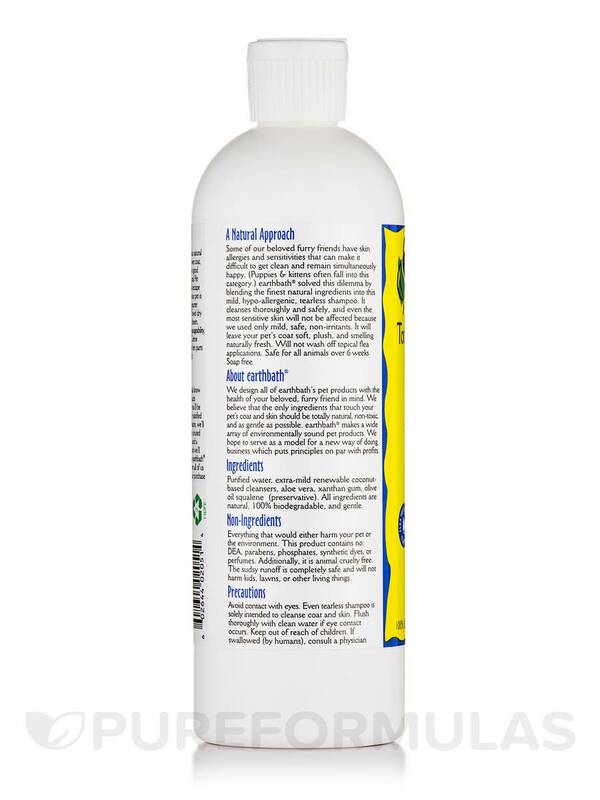 Allergen Caution: This product contains no Parabens‚ Phosphates‚ Phthalates‚ DEA‚ Synthetic Dyes or Perfumes. The sudsy runoff is completely safe and will not harm kids‚ lawns or other living things. We've been using Hypo-Allergenic Shampoo by Earthbath on our dog for about 6 years and are still thrilled with the product. His coat is left clean and soft and his skin clear. It's really nice that he smells truly clean afterwards, not like a product fragrance. We get so much out of the bottle and the price here is good. 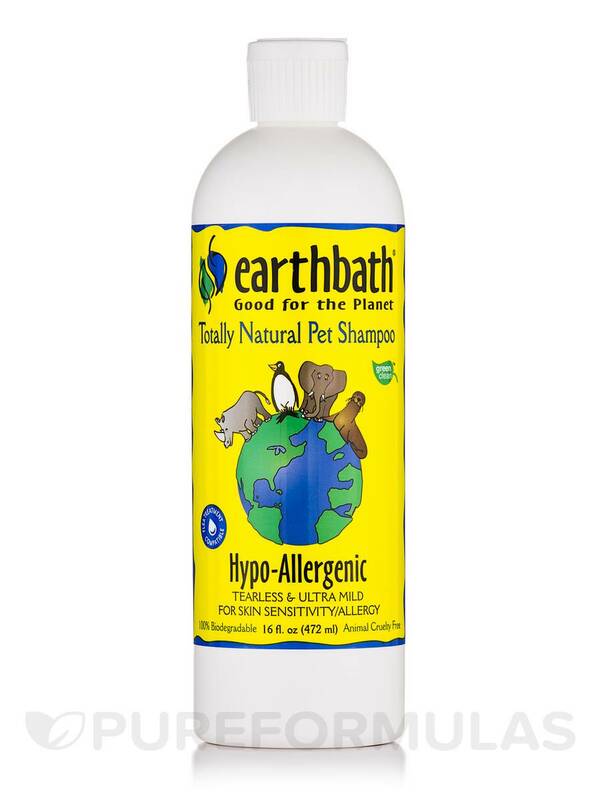 Hypo-Allergenic Shampoo by Earthbath is the only shampoo I use on my dog. It has really helped my dog with her skin allergies and sensitive skin. It does not dry the skin either, has no fragrances, and leaves a soft shiny coat. My dog has had no reactions to this and she scratches less as well. I also use this with the conditioner. Its gentle and effective, I highly recommend this if you have a pet that has allergic reactions.